An alternative effector gene at the type 2 diabetes-associated TCF7L2 locus? After a decade of genome-wide association studies of ever increasing size, there are currently around 100 regions of the genome that are robustly implicated in the risk for developing type 2 diabetes . Now the challenge is to translate these statistical associations into new biological understanding and, subsequently, novel opportunities for prevention and treatment. Across all the genetic regions implicated in type 2 diabetes risk, comparisons with physiological information from individuals without diabetes allow us to point at a primary role for defects in insulin processing and secretion . However, identifying the molecular mechanisms involved at individual loci has proven more challenging. One of the major hurdles is that the majority of genetic variants associated with type 2 diabetes are in non-coding regions of the genome and therefore do not often have an obvious functional consequence. The TCF7L2 locus is a salient example of just how difficult it can be to gain biological insight at an association signal. This locus was first identified in 2007 and has one of the largest effects on the risk of developing type 2 diabetes (∼30% increase per risk allele) of all the genetic signals discovered to date. The association signal is located in an intron of TCF7L2, which encodes the Wnt signalling pathway effector transcription factor 7-like 2 (TCF7L2). Proximity itself is not proof that a gene is mediating the association signal; regulatory effects can occur some way away from the causal variant. However, this characteristic made TCF7L2 a logical place to start and, therefore, this gene has been the focus of most functional studies. In terms of a potential role for TCF7L2 in diabetes, experiments perturbing TCF7L2 expression levels have thus far provided a mixed bag of results. The gene clearly effects glucose homeostasis, but studies have shown divergent directions of effect between gene expression and glucose levels [3, 4] and uncertainty over the primary tissue of action [3, 5]. The other important question, apart from functional candidacy, is whether a gene is indeed mediating the association signal (i.e. the effector gene); here it is worth noting that it is not definitively known whether it is TCF7L2, or perhaps another gene in the same region, that is the effector gene for the type 2 diabetes association. In the current issue of Diabetologia, Xia and colleagues  perform a series of state-of-the-art experiments to provide an alternative effector gene for the TCF7L2 locus, ACSL5. 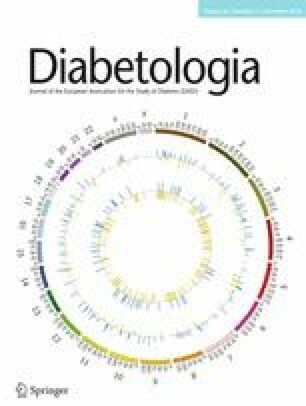 The authors deleted a 1.4 kb genomic region containing the variants most strongly associated with type 2 diabetes, in human intestinal epithelial cell lines. This is a relevant cell type given the role of TCF7L2 in the regulation of intestinal incretin production . Using a combination of gene expression analysis and chromatin conformation capture methods, they identify ACSL5 as a candidate gene mediating the association signal. Deleting the associated region resulted in a strong reduction of ACSL5 at both the mRNA and protein level, compared with control cells, and loss of enhancer–promoter interactions was detected in the chromatin capture assays. By generating two additional smaller CRISPR-Cas9-induced deletions, they went on to show that a 66 bp fragment, containing the most strongly associated variant (rs7903146) at the TCF7L2 locus, could recapitulate most of the regulatory effects observed within the 1.4 kb fragment . Together, the results that Xia et al present clearly demonstrate a regulatory role for the enhancer containing the type 2 diabetes variant rs7903146 on ACSL5 expression. However, to what extent does this finding contribute to the identification of the biological mechanism underlying the TCF7L2 locus? The protein encoded by ACSL5, acyl-CoA synthetase long-chain family member 5 (ACSL5), certainly has good candidacy. Reported whole-body Acsl5 knockout mice show a consistent reduction in blood glucose levels [8, 9] and improvements in insulin sensitivity . In line with this, the study by Xia et al shows lower ACSL5 expression in the non-risk C allele compared with the type 2 diabetes risk-increasing T allele .These findings are also in agreement with previous observations in human islets, which demonstrate that the T allele confers greater enhancer activity at rs7903146 . However, there are strong arguments contrary to a sole role for ACSL5 in mediating the association with type 2 diabetes at the TCF7L2 locus. Although the largest effect of deleting the novel functional element at this locus is related to ACSL5, it does also affect TCF7L2 expression, albeit to a lesser extent. In the publication by Xia et al, a similar picture could be seen in the chromatin capture data, which demonstrated a direct physical interaction between the rs7903146-containing enhancer and the TCF7L2 promoter . There is a clear relationship between the type 2 diabetes-associated variants at TCF7L2 and altered islet function, which has been observed both in physiological data from non-diabetic individuals , as well as in glucose-stimulated insulin secretion measures in human islet culture . Modulation of TCF7L2 expression in human islets affects their function, but since Xia and colleagues have performed their experiments in human colon cell lines and tissue , it is not known whether ACSL5 remains a target of type 2 diabetes variants in islets. Whilst Xia and colleagues were able to show genotype-dependent changes in ACSL5 expression in their cell-line , unfortunately none of the current expression quantitative trait loci (eQTL) studies for human islets , or any other tissue for that matter , show an association between the TCF7L2 locus type 2 diabetes risk variants and expression of nearby genes, including ACSL5 and TCF7L2. This means that, for both ACSL5 and TCF7L2, there are currently circumstantial lines of evidence for their roles as effector genes at the TCF7L2 locus, but that proving this is a hard concept that will require further evidence. Larger eQTL datasets from relevant tissues and replication of Xia et al’s study in more type 2 diabetes-relevant cell types may be greatly informative in identifying the true effector gene(s) at the TCF7L2 locus. However, as efforts of dissecting the FTO obesity locus have shown, these effects can be incredibly complex and might involve more than one gene and tissue type . Given the data now available, it is not unimaginable that a combined effect from TCF7L2 on insulin secretion in islets (and potentially other tissues) and ACSL5 on insulin sensitivity might mediate the association of the TCF7L2 locus with type 2 diabetes risk. Having multiple genes and multiple tissues involved at individual loci would certainly compound the complexity of dissecting mechanisms of type 2 diabetes risk loci. On the upside, it also provides an opportunity for increased clarity on type 2 diabetes pathophysiology and possible therapeutic opportunities. These interesting findings show that, along with improved methods for assaying the function of non-coding regulatory elements, additional uncertainty in the biological underpinnings of genome-wide association loci for common diseases may arise. Approaches for integrating all available genetic, genomic and functional data, specifically the need to perturb gene function in multiple systems to get a good handle on which of these genomic associations make most sense, will be key in addressing the challenges of treating type 2 diabetes and other complex diseases. I am grateful to the following colleagues for helpful discussions and for their comments on the draft manuscript: N. L. Beer and M. I. McCarthy (University of Oxford, Oxford, UK); K. J. Gaulton (University of California, San Diego, La Jolla, CA, USA). MvdB is supported by a Novo Nordisk postdoctoral fellowship run in partnership with the University of Oxford.